I love mushrooms. This recipe makes a great side dish, or a great nibble with some bread to soak up the lemon garlic juices. The earthiness of the mushrooms, the tart of the lemon, and the garlic make for a real winning flavor. Easy to make, but rich in simple flavors. Wipe or brush clean the mushrooms, then trim off the stems close to the caps. 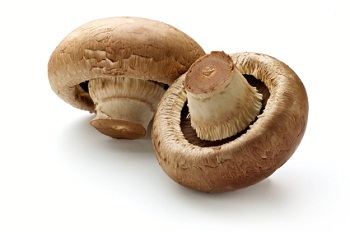 Cut the large mushrooms in half or into fourths. Heat the olive oil in a large, heavy-bottom skillet, then add the garlic and cook for 30 seconds-a minute, or until lightly browned. Add the mushrooms and saute over high heat, stirring most of the time, until they have absorbed all of the oil in the skillet. Reduce the heat to low. When the juices have come out of the mushrooms, increase the heat again and saute for 4-5 minutes, stirring most of the time, until the juices have almost evaporated. Add a squeeze of lemon juice and season to taste with salt and pepper. Stir in the parsley and cook for an additional 1 minute. Transfer the sauteed mushrooms to a warmed serving dish and serve piping hot or warm. This entry was posted in Recipes and tagged garlic, mushrooms, recipe. Bookmark the permalink.